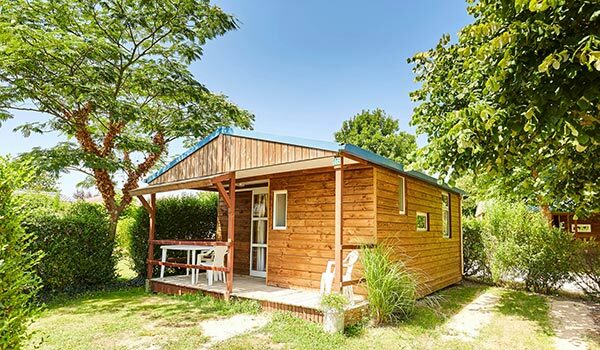 For your holiday as a couple, with family or friends, our cottage at the La Grand’Métairie campsite in the Vendée provide comfort and quiet. Our accommodations have 2 or 3 bedrooms, and each is equipped with a living room and kitchen area, bathroom and toilet. They will be perfect for your holiday near the Vendean beaches. You can select the Premium Cabin 3BR 6 persons : this warm and spacious accommodation with a surface of 37 m2 offers large living spaces for spending time with your loved ones, either outdoors on the terrace or inside. Equipped with a dishwasher, a television, a grill, sheets and deck chairs, this cabin allows you to fully enjoy your holiday at the campsite: pools, spa, activities, and more. You can admire the lush vegetation of our outdoor hotel with mini-farm from the comfort of your deck chair. Our line of cottages also includes the Comfort Cabin for 5 persons that has one bedroom with double bed and a second bedroom with 1 single bed and bunkbeds. This charming, authentic wood cabin is also equipped with a living room and kitchen area. Our 2-bedroom cabin, with the same amenities as the Premium Cabin, is fully accessible to persons with reduced mobility and has a roll-in shower and bathroom that are up to accessibility codes. The accessibility ramp provides access to the terrace where you can dine with your family. This 23 m² rental can also sleep up to 5 persons. Nestled in lush vegetation, our Comfort and Premium Cottages allow you to enjoy the peaceful village of Saint-Hilaire-la-Forêt and blend into the natural setting of our 4-star family campsite. Among our range of chalets, you can also find the chalet Confort 5 persons which consists of a bedroom with a double bed and a second bedroom with 1 single bed and 2 bunk beds. The authenticity and wooded decoration make the charm of this chalet also equipped with a living room with kitchenette. With the same equipment as the latter, our 2-bedroom chalet entirely adapted for people with reduced mobility (PMR) has an Italian shower in a bathroom that complies with PMR standards. The accessibility ramp gives you access to the terrace of the accommodation where you can share your meals with your family. This 23 m² rental can also accommodate up to 5 people. 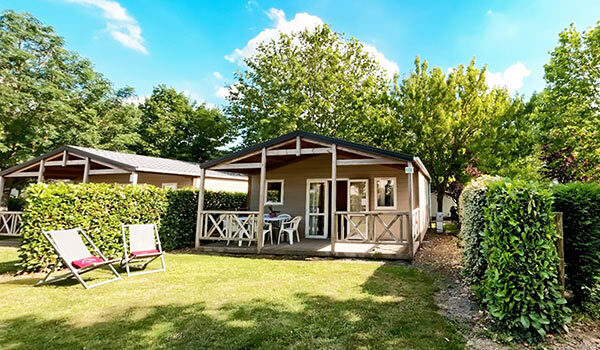 Nestled in the heart of a lush greenery, our Comfort and Premium chalets enjoy the peaceful setting of the village of Saint Hilaire la Forêt and blend into the natural setting of our 4-star family campsite. sed nunc diam dolor. nec venenatis, consequat. mi, non commodo libero. risus.